Arsenal manager Arsene Wenger says he is not worried about his future and is solely focused on Thursday’s match with Manchester City. Arsenal were beaten 3-0 by City in Sunday’s Carabao Cup final and their below-par display prompted fresh speculation about Wenger’s position. Wenger, who has been in charge at Arsenal since 1996, agreed a new two-year contract at the end of last season and says he is not aware of any plans to review his position at the end of the current campaign. “We are in that kind of situation where you want to focus on the next game,” he said. “I don’t ask if your position is reviewed at the end of the season. Asked if he could guarantee that he will still be in charge next season, Wenger said: “Will it stop you sleeping, that my position might not be certain or is certain? No. “What is interesting in football is the performance, it is the game you will see on Thursday night. All the rest maybe makes headlines but it is not really interesting. Arsenal’s display at Wembley came in for heavy criticism, which Wenger says was to be expected. “We have to live with criticism. That is part of the modern game,” he said. 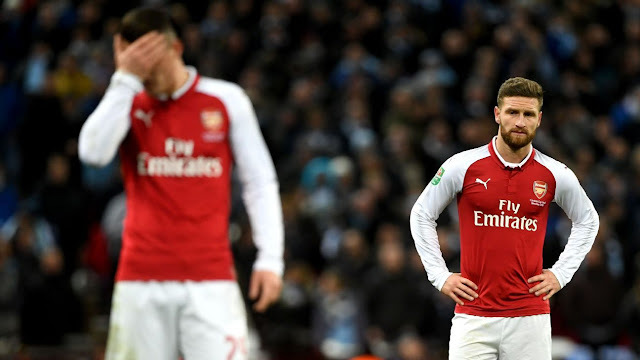 Wenger also pointed out that the Gunners were beaten by the Premier League leaders, and called on his side to be more positive when they bid for revenge on Thursday. “I’m quite amazed at how people analyse,” he said. “It looks like we lost against a team in Division Five, we lost against a team that dominates English football at the moment. We have to take a bit of perspective. “We are very disappointed because we lost an important game. “I felt it was a very tight game until 2-0. Manchester City had three shots on target and we had two.